It is a Chinese restaurant which offers food in a Thailand styled barbeque steamboat. You can drop in to this place when you happen to visit Red Big Strawberry Farms or the Cactus Valley. You will be served dinner in the charcoal steam boat which in itself is a rare experience. The food speaks volumes of the efforts put in by the chefs here. Marinated chicken and bacon, the bean curd, wet bak kut are some of the dishes you must try. The service is prompt and you will find dining here very special and unique. Enjoy the richness of food! To personalise your visit to the city, you can use an all-inclusive Brinchang trip planner for the same that will give detailed information about visiting the city. You can enjoy a comfortable stay in the city by booking the best hotels in Brinchang like Dreamscape Apartment @ Golden Hill, Peony Apartment @ Tea Garden and A5 Barrington Square Golden Hill. Choose from variety of exclusive Brinchang vacation packages for your next visit or create own own. Check out the various options for how to reach Brinchang and finish off your vacation package by booking the ideal transfer. Love this? Explore the entire list of places to visit in Brinchang before you plan your trip. Fancy a good night's sleep after a tiring day? Check out where to stay in Brinchang and book an accommodation of your choice. How popular is Cactus View Restaurant? People normally club together Sam Poh Temple and Kasimanis Strawberry Farm while planning their visit to Cactus View Restaurant. Nothing to complain, all food are tasty and delicious. The hotpot here are nice also! Staff work very fast, highly recommend to hare your meal here! Introduced by a strawberry juice stall boss at brinchang night market, and it was really good recommendation. Ever since then, i would always drop by to have my dinner and craving for steamboat. And it has grill in the middle that allows you to grill your pork slices yummy! Awesome food. Best experienced with a bigger group. We went 2 people the food is really good. Even have a few slices of abalone. Food is tasty. It has some Ala cart food but the steambot/bbq is the main food. Pork is the main ingredient here. There is ample parking but if you double park please have the courtesy to leave your mobile number. Sorry for giving 1 star previously, i think i have mispressed it. 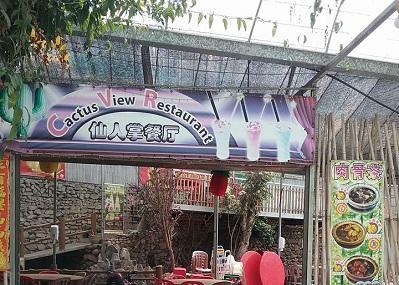 Cactus view restaurant is located just before the strawberry farm Its probably the best place to have steamboat dinner after spending time at the strawberry farm. Foodwise, taste is alright, steamboat is heated up with charcoal. Tasty food with reasonable price. We ordered Bah Kut Teh ,the taste is good.